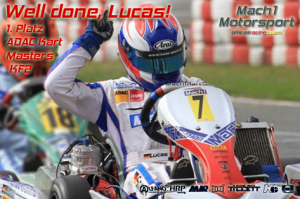 It’s been a successful ADAC Kart Masters season for the German chassis manufacturer Mach1-Kart. Apart from Lucas Speck’s KF2-championship title, the team was also able to place drivers in the top five of the KF3, KZ2 and IAME X30. At the finale in Wackersdorf, they achieved an additional double victory in the IAME X30. Team leader Martin Hetschel was very excited about the finale of the ADAC Kart Masters at the Prokart Raceland. With Lucas Speck (KF2) and Cedric Piro (KF3), two drivers were standing chances to gain their classes’ championship titles. The Saarland citizen Cedric Piro got off to a good start: After ranking 14th during qualifying, he improved his performance during the Heats and gained 7th starting position for the first final. During this he experienced a setback though. Cedric was involved in an accident right after the start and fell back to the end of the field. Due to a proper amount of fury he wasn’t willing to give up yet and fought his way forward to 15th position. Even though his dream of winning the title was over, he still wanted to give it his all during the second final and just barely missed placing on the podium by coming in 4th. He thus finished the championship on the great fifth place. Norwegian Nicolai Hagenaes also had a good run: during his second event in Germany, he was able to drive in the front of midfield and came in 12th during the first race. The only drop of bitterness came during the second final, where he had to forfeit the race during the first lap. Since the second race of the season in Ampfing, Lucas Speck had been leading the overall list of rankings in the KF2 and was not willing to give up his position during the finale in Upper Palatine. He started the races in highly motivated and was among the fastest drivers once again. He presented a clever driving style during the races and didn’t take high risks. He drove in the front field and sealed the deal by coming in 3rd and 4th. With an advance of 13 points, he was the overall winner of the KF2. “Lucas deserved to win,” praised team leader Martin Hetschel his young driver. “We would have been able to win these races as well, but the title was most important”, continued Hetschel. Teammate Manuel Valier was in his best form as well and also established himself in the front field of the strongly manned KF2. In the end he came in 5th and 6th, reaching 4th place in the overall list of rankings. Five drivers started in the IAME X30 for the manufacturer from Swabia. Alexander Heil was unstoppable this time. After ranking 2nd during qualifying, he really improved his performance even more during the races and held his entire competition at bay due to strong maneuvers. He earned a lot of praise for achieving a double victory and was able to defend his third place in the overall list of rankings. His four teammates Jan Jesse, Baldur Bahn, Lukas Korsch and Sebastian Schwendt fought some enthralling battles in midfield and were able to achieve top ten rankings. Sebastian Schwendt did particularly well: during his first participation in the senior class he made do with the new material perfectly and was able to collect championship points right away. Toni Greif fought for the vice-championship title at the shifter karts. He got off to a good start by ranking 7th during qualifying and was able to defend this position during the Heats. It went down to business during the races then. Toni temporarily drove on 3rd position, but an opponent’s strong attack made him fall back to 6th place during the first race. He then came in 8th during the second run and thus placed 5th in the overall list of rankings, just nine points behind the second winner. This will take place in three weeks in Belgian Genk. Mach1 Motorsport is currently ranking 3rd with driver John Norris.